The mention of town plats in my last post made me think about the fact that very few Montana communities actually have a formal, platted Town Square. One of the reasons for this is probably the fact that so many Montana townsites were originally laid out by the railroads, and they usually favored simple, standardized (and cheap) designs. Here's a fairly surprising shot to illustrate -- this is the Teton County Courthouse in Choteau, moments after it was firebombed by angry protesters! 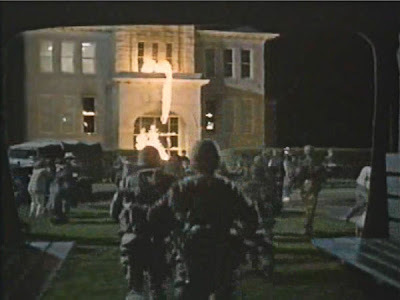 And if you don't remember that bit of history, there's good reason ... it's all a Hollywood special effect, created during the filming of the 1988 movie War Party.